After 30 years as an equestrian, animal advocate Pam Ahern’s life took a very different direction after reading one book. Pam Ahern is this week’s Changemaker. Founder and Director of animal welfare Not for Profit Edgar’s Mission, Pam Ahern had led a successful equestrian career that spanned over three decades – which included winning the prestigious Garryowen Trophy at the Royal Melbourne Show twice, the Australian Champion Rider of the Year, and many awards at Royal Shows around the country – before she says an epiphany in the 1980s caused her life to take a serious turn. “I had always loved animals and was heavily involved with the rescuing, rehabilitation and re-homing of cats and dogs along with assisting wildlife, but it was a line in a book that stopped me mid-sandwich,” Ahern says. 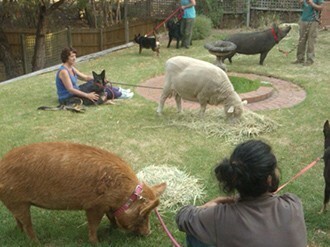 However entering the Not for Profit sector didn’t occur until 2003 when she rescued a pig she named Edgar Alan Pig. 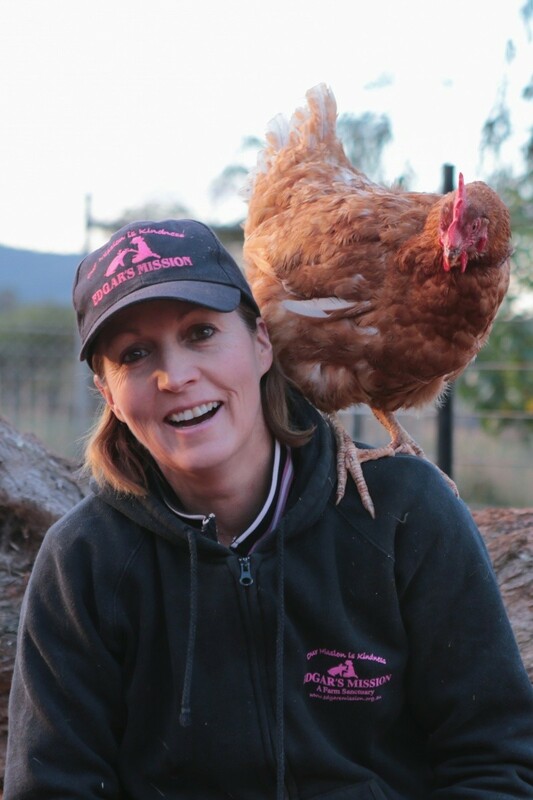 “We have become so removed from farm animals that so many of us do not realise the incredible fun loving and emotional creatures these guys and gals are,” she says. “We would never dream of eating the family cat or treating our dogs the way we do farm animals and when you consider that we really do not need to harm or even eat animals to live happy and healthy lives, something inside you comes alive. Ahern says in 10 years, thousands of farmed animals have been given a second chance at life after having made their way through the farm gates. Ahern is adamant that she will never tell people what to do or not do, but rather she encourages people to come to their own conclusions, holding firm to the belief in the goodness of the human heart. It is through the work of Edgar’s Mission that Ahern believes people can determine that kindness for all: animals, people and the planet is the key to a better world. “Our greatest challenge is to get people to come to the table and really think about these things,” she says. Our major focus is securing our new forever home for the sanctuary. Whilst money is needed to fund our work, making money is not our driving force, making kindness is. Edgar’s Mission achieves many goals, such as making the world a kinder place, changing the way people view farmed animals, empowering people to make kinder choices, and enriching the lives of disadvantaged community members. However, I would have to say the most rewarding work is directly saving the lives of animals and seeing them transform from frightened and sickly to happy and healthy little (and oft times not so little) critters. This is overcome by knowing if I stopped, the animals would have no-one to fill the void and the groundbreaking and life-saving work of Edgar’s Mission would stop also. Edgar’s Mission has also become my mission, my life’s work and legacy. Working with the animals and seeing how happy and healthy (and alive) they are, all because of Edgar’s Mission. I have just started reading Message: the communications skills book as I wish to be the most effective animal advocate I can be, and better understand my fellow human beings. To one day know that we do not need organisations like Edgar’s Mission. Edgar Alan Pig. I often wonder what my life would be like now if not for Edgar. In 2003 he came into my life and both his and mine changed forever. I gave up my full-time paying job, my successful equestrian career, and said farewell to ever having a normal life as I dedicated my life to the protection of farmed animals. Edgar’s Mission has become my most profound way of saying sorry for the harm and suffering I had caused to animals like my dear Edgar, he truly has been my inspiration. Editor’s note: Last week’s Kilmore region bushfires came within less than one kilometre of Edgar’s Mission, with 101 animals evacuated in stages from the property as the fire threat worsened. Ahern said she brought almost 80 hens and roosters inside her farmhouse to protect them, while two supporters took in the evacuated animals in their suburban homes. Evacuees from Edgar's Mission enjoy some suburban hospitality during last week's fires. After an exhausting week of being on alert and fire ready day and night, Ahern and her helpers now face the heartbreaking task of assisting local farmers and landowners with injured and lost animals. Ahern has already bought nine head of cattle she rescued after they fled from one neighbouring property. “It’s sad that these animals have survived the fires only to face being sent to slaughter because their owners can no longer feed or house them,” Ahern said. Ahern’s regular blog posts during last week’s fire threat can be read here.